What would we do without clean water? From brushing our teeth to boiling pasta, we use the life-giving liquid all day long. But it's outside—not in our homes—where we waste the most resources. 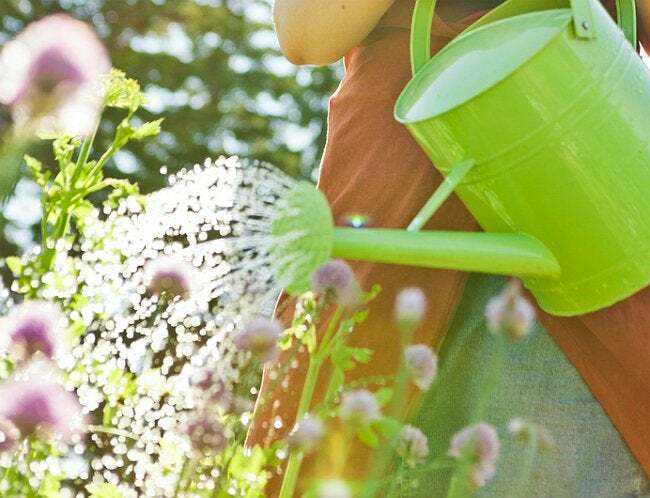 Do your part to save water in the garden with these fast fixes. Playing nice with the planet includes conserving resources, and good old H2O is at the top of the list. Every gardener can cut down on water waste at home with a few simple changes. First, instead of dousing your flowers and vegetables with gallons of water all at once, use a soaker hose. You’ll get less runoff and less evaporation. Bend a flexible length of gutter to guide water from a downspout into a rain barrel. Rain barrels come in a variety of sizes and are available at home improvement stores. If your prefer your plants in hanging baskets, pick self-watering containers. When the soil dries out, the built-in water reservoir at the bottom replenishes moisture. Decorative ceramic pots, on the other hand, should be treated with a sealer to make them less porous. Finally, try adding water-absorbing crystals to the soil. They’ll keep your plants from drying out, even if you forget about them for a few days.